Deionised water is water that has had almost all of its mineral ions removed, such as cations like sodium, calcium, iron, and copper, and anions such as chloride and sulphate. Deionised water can be used to top up batteries, and can be used in steam irons. As this water is de-ionised it prevents furring and scale formation, which over time, could cause damage. 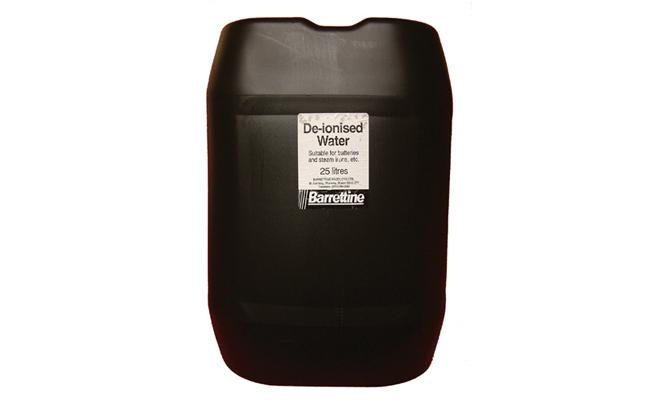 Add deionised water to your wholesale laundry and washing detergents supplies. Browse our large range of cleaning chemicals and wholesale cleaning supplies at Pattersons Cleaning Supplies. Many products ready for next day delivery. If you have any questions about the range of laundry supplies we stock at Pattersons Cleaning Supplies, please contact our customer services team on 0117 934 1270, or email us on web@pattersons.co.uk.